Would you like to upgrade your license for Envira? This is very simple and we’ll walk you through each step on how to upgrade your license. The first step to upgrade your license for Envira is to log into your Envira Gallery Account. Once logged-in, click on the Overview tab and select Upgrade. Once you do that, you will be brought to the upgrade page. You’ll now see the license levels that you can upgrade to. Select the license level you need and click Upgrade. All upgrades are pro-rated, meaning that you’ll only pay the difference between the 2 licenses but that amount is also pro-rated based on the time you have left for your current license. Select the payment method and complete your license upgrade. 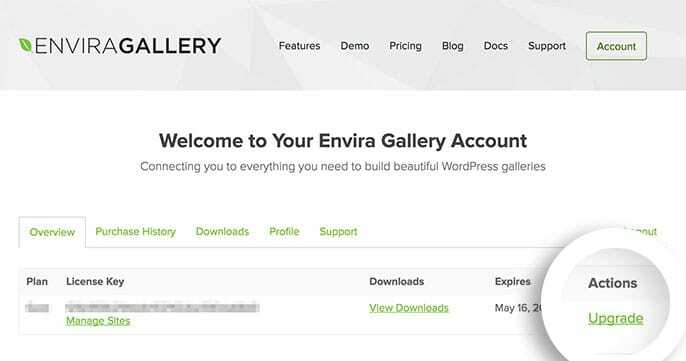 Once you’ve upgraded your license, head over to the WordPress Admin » Envira Gallery » Settings screen and select the Refresh Key button. This will refresh the license key and will now show you the license you just upgraded to. Congratulations, you have upgraded your Envira License! There are many things you can do with Envira, why not check out our documentation for the addons now included in your upgraded license!